When it comes to healthy living, many experts point to proper nutrition as the key for building a strong foundation. Eating right is the surefire way to promote healthier living, yet many of us are not receiving proper nutrition. As we grow older, the need for healthy eating requires more attention than ever. Senior citizens are often not receiving proper levels of nutrition, creating a myriad of issues if not rectified. Lares Home Care is proud to offer senior home care to Matawan residents and beyond, providing quality independent living in New Jersey. 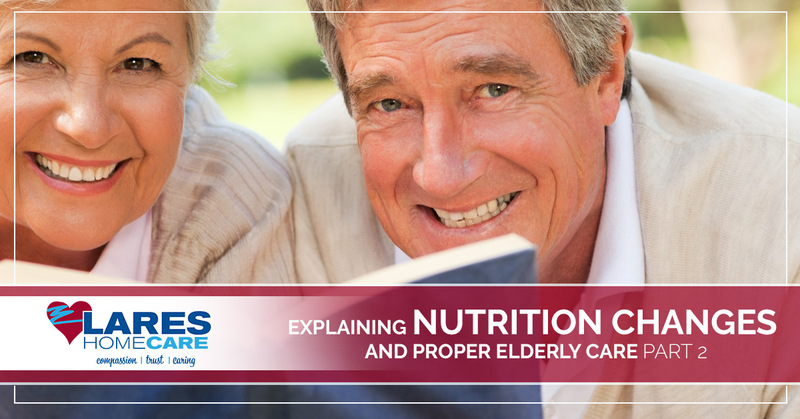 Today, we’ll continue our look into the importance of nutrition for the elderly and how their dietary needs should be a top priority. If you or a loved one are looking for non-medical home care, be sure to contact our independent living aides today to learn more! Calcium is a vital player in the fight for proper bone health. As we age, the density of our bones decreases, creating the need for additional support. While an adult between the ages of 19 and 50 are recommended to consume 1,000 mg of calcium per day, seniors over the age of 50 should be taking upwards of 1,200 mg per day. This can be a difficult task, as this much calcium roughly equates to four cups of milk. Your loved one’s personal care assistant can help in this process, promoting proper consumption or even supplying a calcium supplement when applicable. Fatty acids are a beneficial part of the nutrition plan that can prove to be very helpful for reducing inflammation. Recent medical research has shown that inflammation may be to blame for numerous health complications, from cancer to heart disease and more. Omega-3 fatty acids are essential, and serving foods that are rich in these hydrocarbons such as fish and flaxseed can prove to be a beneficial move. Beyond these two points of focus, seniors also need to focus on consuming enough potassium, fiber, minerals, vitamin D, and more. Keeping on task with these dietary needs can boost health and energy levels, keeping your loved one mobile and independent. As we age, our overall body water content decreases, reducing the craving for H2O. This can oftentimes lead to dehydration, which is a major cause of hospitalizations for senior citizens across the country. When you are elderly and dehydrated, the risk for health issues rises exponentially. It is essential to promote proper hydration for your loved one, even if they are not thirsty. Our elderly care professionals can incorporate water measures to boost health with our patients’ independent care plans. Taking care of your loved one while allowing them to retain their independent living in New Jersey is why Lares Home Care is in business in the first place. Our passion for helping patients thrive on their own while regaining their health and mobility help to make us your Top Rated Local® home care team. Next time, we’ll look at a few practices to avoid for senior citizens and their diets. If you are looking for a quality way to help your loved one enjoy their independence, be sure to contact our Matawan home care professionals today!